Share Market Updates: Sensex closed 353 points lower at 38,585, the Nifty ended 87 points lower at 11,584 levels in the trade today. The top losers of the BSE Sensex pack were Bharti Airtel Ltd. (Rs. 340.05,-3.28%), Asian Paints Ltd. (Rs. 1412.45,-2.15%), Tata Consultancy Services Ltd. (Rs. 2043.80,-2.12%), HDFC Bank Ltd. (Rs. 2242.70,-2.07%), Housing Development Finance Corporation Ltd. (Rs. 2027.40,-1.96%), among others. The Market breadth, indicating the overall strength of the market, was weak. 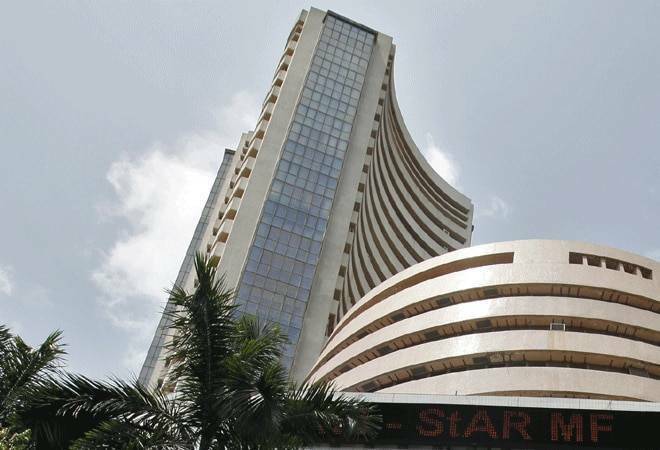 On BSE out of total shares traded 2901, shares advanced were 1233 while 1475 shares declined and 193 were unchanged. On the sectoral front, BSETECk index and BSE Metal index were down. Overall 22 closed in the red out of 30 stocks on Sensex and 32 declined out of the 50 stocks on Nifty. 3:40 pm: Nifty was trading down by 87 points and Sensex by 353 points in the last lap of the day's trade. 3:20 pm: Almost 1404 Stocks have declined against 1126 advanced stocks and the market cap of the entire market has fallen by 0.33%. Market has fallen 0.40% while volumes have fallen by 12.39%. 3:15 pm: Tata Motors filed sales figures to the exchanges in the last hour of the trading session. The March global wholesales numbers have slipped 5% at 1.45 lakh units on a yearly basis. The Global wholesales of all passenger vehicles were also lower by 9% at 0.88 lakh units in March 2019, compared to same period last year. "Jaguar wholesales for the month were 20,985 vehicles, while Land Rover wholesales for the month were 49,186 vehicles," the filing added. The stock closed 4% up at Rs 215.30 on BSE. 3:00 pm: The stocks that hit 52-week high are Info Edge (India) (1.41%), ICICI Lombard General Ins (0.34%). 2:45 pm: Market has fallen 0.40% while volumes have fallen by 12.39%. Almost 1404 Stocks have declined while 1126 have advanced. The market cap of the entire market has fallen by 0.33%. 2:30 pm: Shares of HDFC Bank fell over 2 percent intraday on April 10 on reports of private equity giant KKR & Co offloading 0.42 percent stake in the private lender. There has been a spurt in volume traded by almost 13.36 times on the stock today. From the opening price of Rs 2255, the stock fell to day's low of Rs 2242. 2:15 pm: Tata Motors (4.49%) Oberoi Realty (4.37%) 3M India (3.87%) were the top gainers for the day. 2:00 pm: Share price of GE Power India Ltd. rose 2.4 % to day's high of Rs 870.95 against yesterday's close of Rs 850.40 as the company announced today that it has been awarded a Rs 142 crore (USD 20 million) order by NTPC for supply and installation of low NOx combustion system for 10 GW of thermal power plant capacity across the country. 1:45 pm: Among the 50 stocks in the Nifty index, 29 were trading in the green, while 20 were in the red. 1:30 pm: BSE SENSEX is at 38730.72 down by 208.5 points or by 0.54 % and NSE Nifty is trading at 11,666 down by 5.95 points or by 0.05 %. Nifty's volatility has been low at 0.36%. The BSE Sensex touched intraday high of 38950.45 and intraday low of 38701.86. On the other hand, the NSE Nifty touched intraday high of 11680.05 and intraday low of 11638.6. 1:20 pm: With a trend reversal, the shares of Praj Industries halted a 7 day decline and rose as much as 7.8 %. According to its statement on the exchanges, Praj Industries signed a construction license agreement with Gevo Inc, USA to commercialize the technology for production of lsobutanol using sugary-based feedstock such as juice, syrup and molasses. The stock is currently trading at Rs 147.50, up 7 %. 1:10 pm: Market has gained 0.02% while volumes have fallen by 16.31%. 1:00 pm: 31 sectors have advanced (Top gainer: Nifty Realty 2.30 %) while 12 sectors are declining (Top loser: Nifty Finance 0.50%). 12:50 pm: BSE Realty (2.25%), Nifty Realty (2.23%), Nifty Pharma (1.38%) and BSE Healthcare (1.27%) were the top gainers among the sectoral indices on BSE & NSE. 12:40 pm: GMR Infra's promoter, IDBI Trusteeship Services Ltd. has released 6.9% of pledged equity shares amounting to 37 crore shares yesterday. After the release, holdings of IDBI Trusteeship Services Ltd. has reduced to 14.08%. The share price of GMR Infra opened at Rs 18.80 and fell to the day's low of Rs 18.55 against the previous close of Rs 18.75. 12:30 pm: Shares of Tata Motors hit a six-month high of Rs 212, up 3% today, and achieved the highest level recorded since October 10, 2018, on expectations of better Jaguar Land Rover (JLR) Q4 results. 12:20 pm: Speaking on the market direction, Epic Research's Nadeem said, "The market for this year seems to be fairly bullish in terms of its trend. The underlying primary trend is bullish which has not been violated yet. Market on higher time frame is looking in much better shape as the noise is less over there. Trending above its longer-term moving averages like 50, 100 and 200 gives it a clear thrust on any dips. We have been performing, rather outperforming, the global indices in terms of returns for last 1 year. The intermediate target for market is placed at 12,100 - 12,200. These numbers now seem to be very close. With Lok Sabha elections on the horizon, we believe there may be some rise in volatility that can hurt any short-term directional investor. Hence, it will be prudent to utilise any dips towards those crucial moving averages such as 20 and 50. We believe these dips should rather provide a comfortable risk that can be taken to reap the benefits. One should look to accumulate in the range of 11,100 - 11,200 as these are points of inflection for this uptrend." 12:10 pm: Tata Sponge Iron completed the acquisition of steel business including captive power plants of Usha Martin, pursuant to cash consideration of Rs 4,094 crore to Usha Martin. The company also announced BoD meet on April, 18 to consider and approve the audited financial results for March quarter and recommend dividend, if any. The stock has achieved a 5.5% hike to day's high of Rs 785, after opening at Rs 754 against the previous close of Rs 744. There has been a surge in the volume traded by 1.74 times today, as per BSE. 11:55 am: Avenue Supermarkets, D-Mart parent company, raised Rs 50 crore via commercial papers. It closed at Rs 1,482.20 yesterday and opened at Rs 1,480 today and rose to intraday high of Rs 1,485. 11: 45 am: Tata Motors (3.01%) HUL (1.05%) and Kotak Bank (0.98%) were top Sensex gainers. 11: 35 am: Top Sensex losers were TCS (1.39%), HDFC Bank (2.05%) and Asian Paints (1.14%). 11: 30 am: Mustafa Nadeem, CEO at Epic Research said, "The Lok Sabha Elections will have some impact and increase the volatility in market, but this will also be able to establish the plot for long-term trends. Other factors that are likely to drive the market in the near term are lower inflation, lower interest rate environment, Federal Reserve's dovish stance, higher capital inflow and appreciating rupee (near term). These are some factors that will drive the Indian equity markets in 2019. Crude oil is an another factor that may cap the upside as the supply side concerns, continuous fall in supply, lower output and sanctions on oil producers are fueling the crude oil prices. We are extremely bullish on the levels of Nifty/Sensex which may lead Nifty to test the levels of 12,300 while Sensex should test 40,700." 11:20 am: The Initial Public Offering (IPO) of Polycab India Ltd was subscribed 52.50 times yesterday, the final day of bidding. The Rs 1,345-crore IPO received bids for over 91 crore shares against the total issue size of more than 1.76 crore shares, as per the NSE's data till 1615 hrs. Price range for the offer, which opened for bidding on April 5, has been fixed at Rs 533-538 per share. 11:10 am: Lakshmi Vilas Bank Ltd. announced yesterday after trading hours about the fundraising plan by preferential allotment of equity shares. The bank is yet to get the approval from shareholders of the bank. The share price opened at Rs 88.70, 4% below the previous close of Rs 92.50. 11:00 am: Yesterday, the telecom giant Vodafone Idea announced post-trading hours that its Rs 25,000-crore rights issue will open on Wednesday. The fundraising is one of the largest by any company in the country. The company plans to issue up to 20 billion fully paid-up equity shares of Rs 10 face value at a price of Rs 12.50 per share. The share price of Vodafone opened at Rs 17.10 against yesterday's close of Rs 16.90. 10:50 am: The International Monetary Fund (IMF) yesterday, has cut the growth forecast for India by 20 basis points for the fiscal 2019-20 to 7.3%. It has also cut India's growth forecast for 3 years. According to IMF estimates, India's economy grew 7.1% in FY19 and is expected to accelerate to 7.3% growth this fiscal and to 7.5% in FY21. All the estimates are 0.2% points less than its previous assessment in January. 10:40 am: The International Monetary Fund (IMF) has lowered its growth forecast for 2019 to 3.3 percent from the previous level of 3.5 percent in its latest World Economic Outlook (WEO). This is the third time in six months that the fund has revised its outlook downward. 10:30 am: Indiabulls Real Estate rose more than 11% in the early morning trade. The stock continues to move higher and has gained over 33% price momentum in the last 4 days. With spurge in volume traded over 2.2 times, 22.15 lakh shares and 191.33 lakh shares have changed hands in BSE and NSE, respectively. The stock currently trades at Rs 118.50, up 9.62%. 10:20 am: No bidder came forward for the bidding process of Jet Airways to buy lenders' stake in the airline yesterday, even though lenders led by the SBI offered ownership between 32.1% and 75% in the airline. The call for Expression of Interest (EoI) will end at 6 pm, today. In a separate development, Naresh Goyal has told lenders seeking to rescue the carrier that he will pledge the rest of his shares to them on condition they release the promised interim loan funding of Rs 1,500 crore without delay. Yesterday, the share price of Jet Airways closed 1.34% up at Rs 267.65. The stock opened 2 points below at Rs 265.90. 10:10 am: Nifty has been gaining for the last 2 days and has risen 0.61% in the period.The market has gained 0.10% while volumes have fallen by 12.89%. 10:00 am: IT majors TCS and Infosys to report their Q4 numbers on April 12. 9:55 am: Wipro, Yes Bank, Infosys, M&M, and Kotak Bank were top gainers on Nifty, while Hindalco, Eicher Motors, Adani Ports, HDFC, and HDFC Bank fell the most. 9:50 am: Sensex is down by 55.61 points. Small Caps has led the market with Nifty Small 100 gained by 0.44%. 9:45 am: While all Market Cap categories have gained, Small Caps have led the market with Nifty Small 100 change of 0.56%. The market has gained 0.10% while volumes have fallen by 12.89%. 9:40 am: BSE Cap Goods has been gaining for at least 5 days. 9:35 am: 34 sectors have advanced (Top gainer: BSE Realty 1.89 %) while 9 sectors are declining (Top loser: BSE IT -0.45%). 9:30 am: Top losers in the opening session are Whirlpool Of India (-1.38%) Eicher Motors (-1.12%) Hindalco (-1.11%). 9:20 am: Hindalco top Index loser in opening trade as the co. announced that it has temporarily suspended operations, Muri Plant, Jharkhand due to spillage in red mud cake storage area. 4 persons with minor injuries have been treated, & 1 contract workman is missing. This incident is not expected to have any material impact on the company's performance. The stock opened Rs 0.75 below yesterday's close of Rs 216. 9:15 am: Market opens with minor cuts; Sensex tanks almost 100 points, Nifty around 11,650 level. 9:10 am: The Indian rupee opened flat at 69.28 per dollar on Wednesday versus previous close 69.29. 9:05 am: Asian markets slipped after the IMF slashed 2019 global growth outlook again from 3.5% to 3%. Nikkei, Hong Kong, and South Korea The index slipped half a percent each. US Dow Jones declined 0.7% amid renewed concerns about slowing global growth and an escalation of trade tensions. European stocks declined on the news that the US President may impose a new tariff on Europe Union. 9:00 am: Expectation of markets to open lower on account of weak global cues. The first phase of Lok Sobha election will commence tomorrow. Thus, intra-day volatility expected in the market. 8:55 am: Dow Jones (US) down by 0.32%, Straits Times (Singapore) down by 0.22%. Benchmark indices Sensex and Nifty opened in the red after International Monetary Fund (IMF) slashed its growth outlook for India and the global economy. Intra-day volatility is expected in the market as voting for the first phase of Lok Sabha election commences tomorrow.